We all know by now that diet and lifestyle choices influence both how and how quickly we age. One result of studies on this topic is ample confirmation of the Cayce material on various aspects of what we might call preventive health care. Slowing the signs of aging is a worthy goal, but is it possible to go a step or two further and stop the clock, or even reverse the process? To this question the readings give an emphatic yes! Such a radical possibility goes way beyond common catch phrases such as "anti-aging." The readings favor the term rejuvenation for the process by which entire bodies, or certain systems, are made youthful again. Rejuvenation, according to the dictionary, creates a state of rejuvenescence, a delightful word for growing young. Anyone who thinks he's too old to start the rejuvenescence process rolling had better think again! *Excerpt reprinted with permission of the publisher. Copyright C 2012 by Carol A. Baraff, All Rights Reserved. 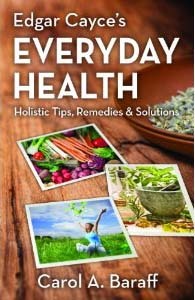 To order a copy of Everyday Health from Amazon.com, click here!